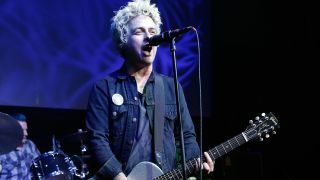 Green Day’s Billie Joe Armstrong admits that he still has moments of self-doubt when he’s not doing anything after labouring over the band for two decades. Bassist Mike Dirnt recalls how the frontman insisted the trio worked non-stop “for 20 years,” practicing six times a week and treating the band “like a vintage sports car” that would rust if they didn’t keep it tuned up. But Armstrong admits his motto wasn’t true – and he learned that the hard way – resorting to pills and alcohol to get through the day at his lowest ebb. He has now been sober for four years. He tells Rolling Stone: “You can’t be enthusiastic for the sake of enthusiasm. You have to get out of trying to outdo and one-up yourself all the time. He adds: “It’s just that gloom and trying to rise above it. Sometimes when you’re home by yourself, there’s that feeling that you’re kind of spiritually unemployed – and you’re trying to figure out who you are. Revolution Radio is out on October 7. It’s available for pre-order. They’ll tour North America this autumn before hitting Europe in January 2017. Tickets will go on general sale from tomorrow (September 9) from 9am local time via the band’s official website.